Penguins and snowboarding... what could be better? Celebrate a fun-loving spirit with this adorable Snowboarding Penguin charm by CHARM IT! Featuring white hearts down the center of the hot pink snowboard, this black and white penguin is staying warm with its a purple scarf and yellow-trimmed hot pink hat. Easy to attach to your charm bracelet with the simple snap of a clasp, this CHARM IT! 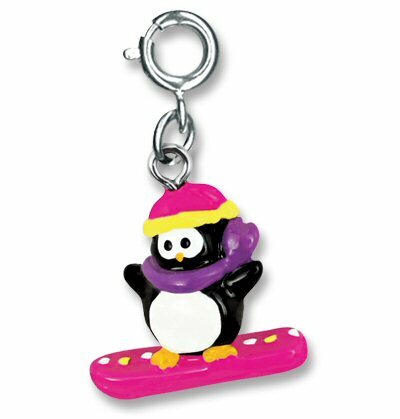 Snowboarding Penguin charm is sure to delight. This Mini Flopsies stuffed baby emperor penguin may look like he's trying to nap, but he's really ready for fun and adventure with you.